Jigsaw Concepts Wishes it’s Clients a Merry Christmas 2015! It’s been a great year in 2015 and that’s because of our great clients, many of which have also become great friends. We’d like to wish you and your family a heart felt Merry Christmas and a Prosperous and Successful year in 2016! May all your business goals be exceeded in 2016! Dan & the team at Jigsaw Concepts. 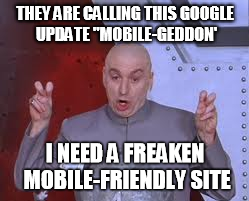 Google is about to roll out a massive update that is being nicknamed ‘Mobile-Geddon’ and the Mobile Apocalypse of 2015. To be rolled out on 21st April 2015. Thank you to all our valued clients for your business in what has been a fantastic year! We’d like to wish you and your families a Merry Christmas and a Happy New Year. May 2015 be a cracker year for you and your business and we look forward to working with you again in 2015. Merry Christmas and a Happy New Year from the Jigsaw Concepts Team. Enjoy your festive season with your loved ones and rest up for a fun and prosperous 2013 year! I would like to use testimonials on our ———–.com website, do you recommend them and if so, what is the best way to use a testimonial? Hi, yes we definitely recommend the use of testimonials for any business. A testimonial is a statement in support of a particular truth, fact or claim as it relates to your products or services, it can also be as simple as a personal recommendation.